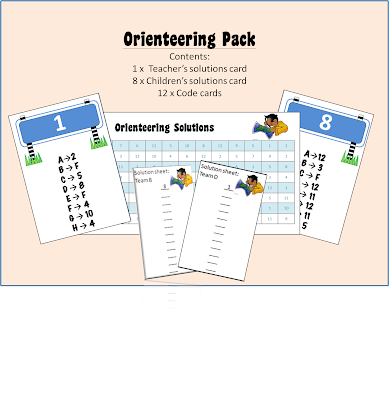 I'm giving away this orienteering pack to anybody who comments below to say that they already follow or have just become a follower of my blog (please leave your email address in the comment box!). The orienteering set is very easy to use. Simply, draw out a map of the area in which the children will play, stick the code cards around the area (put the corresponding numbers on your map), divide the children into teams, give them a solution sheet, then sit back and relax until the children come back to you at the end of the activity to check their solutions against your teacher's solution card. I'm a follower and would love an orienteering packet - thanks! Thanks for sending the files. I am a new follower. I would love this packet for our " camp" day.